Boy has a lot changed in our lives over the last few months. We've moved to a new house in a new city (what a huge process that was!) and I've got a new job. If you've visited our website lately, you'll also have noticed that it's changed a lot too. We've fully restructured the site, and Ric (who happens to be a freelance graphic designer) has completely re-designed it, as well as made it much more mobile-friendly. So now that things have settled down a bit, you'll be hearing a lot more from us. We're excited to be spending time in the kitchen again experimenting with Mediterranean and Asian meals — and sharing the best and most delicious results with you. Speaking of delicious results, this recipe certainly ticks that box. 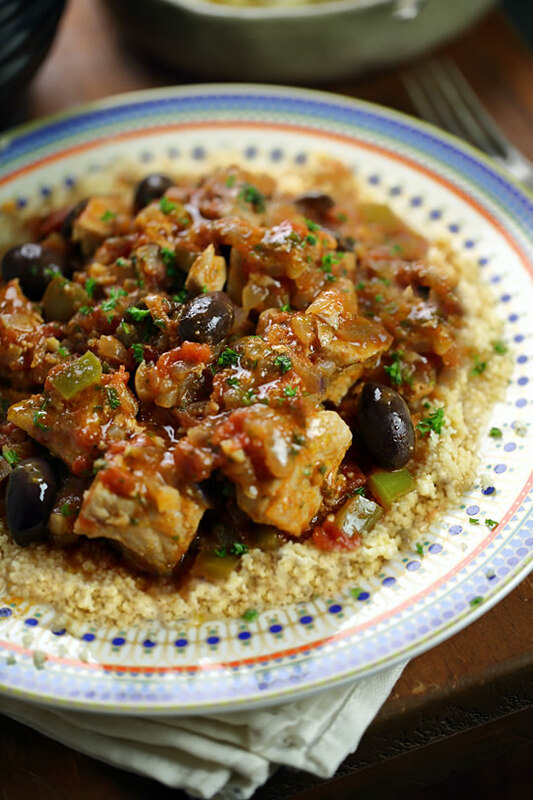 It's a delicately-spiced Moroccan stew with chicken, green peppers and plump black olives. Moroccan stews are called tagines because they're traditionally made in a glazed earthenware pot with a cone-shaped lid called a tagine. However, a large saucepan works just as well. This stew tastes extra good served over a bed of fluffy couscous. Or you can serve it with rice or crusty bread. HEAT 2 tablespoons of the oil in a large saucepan over a medium heat and cook the onion and green pepper for 6 minutes, stirring occasionally. ADD the garlic and spices and cook, stirring constantly, for another minute. ADD the stock, tomatoes, salt and pepper and bring to the boil. COVER the pot, reduce the heat to medium, and simmer for 10 minutes. ADD the chicken and olives to the stew and simmer, uncovered, for another 8 minutes. WHILE the stew simmers, cook the couscous according to package directions. ADD the lemon juice, parsley and reserved tablespoon of olive oil to the stew. 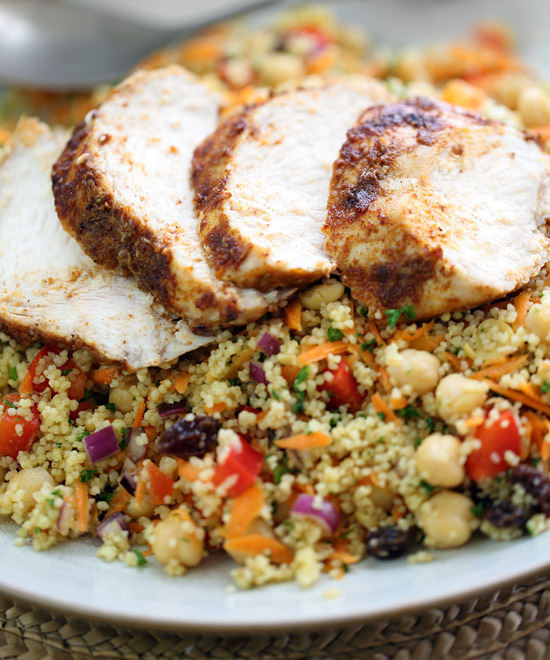 SERVE over a bed of couscous. 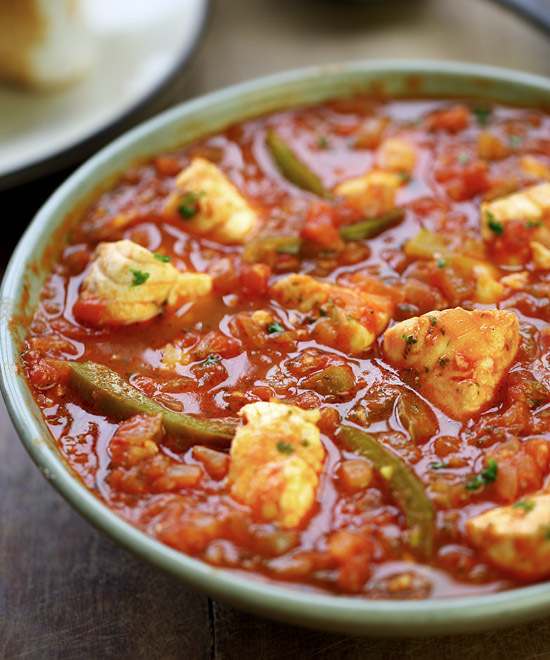 Variations: Use shrimp, fish (cut into cubes) or chickpeas instead of the chicken. Replace the green pepper with red pepper.